Frankie Adams is a New Zealand-Samoan actress who is loved for her brilliance on screen and also adored by fans because of her beauty and innocent looks. Some fans have even joked that she is the ‘harmless dove on TV’ because of how seemingly blameless she appears. Having established herself as an actress to watch out for, Frankie has garnered loads of fans who follow her activities on social media. As an actress, Frankie is now mostly known for the roles she has played in Shortland Street, a soap opera which launched her into immense fame and The Expanse, a science fiction TV series. 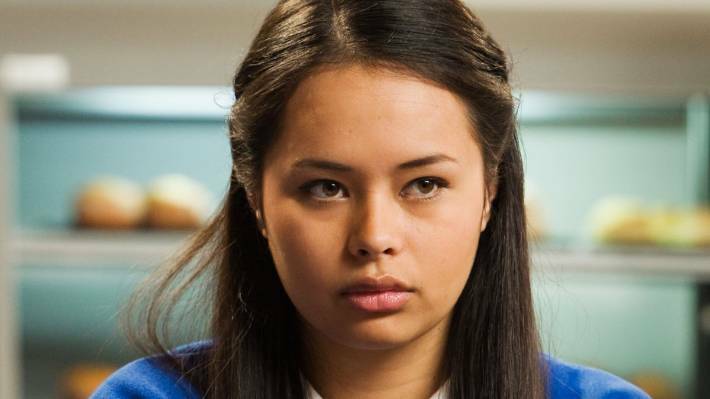 Frankie Adams was born on the 3rd of January, 1994 on the island of Savai’i in Samoa, a county in Oceania. Her mother has been identified as Lau Adams and her father’s name is given as Allan Adams. Sadly, Frankie’s father died when she was just 6 years old. The man reportedly died after he suffered a sudden heart attack. Frankie has two younger sisters identified as Julie Adams and Flo-Jo Adams. Even though she was born in Samoa, Frankie and her family moved to Auckland, a city in New Zealand, when she was just 3 years old. It was in New Zealand that her father died. Growing up, the actress attended Auckland Girls Grammar School, a secondary school for girls located in Newton, New Zealand. The actress started development interest in acting and stage performance right from when she was a young girl. According to reports, Frankie actually studied drama at Auckland Girls Grammar School and began honing her acting skills from there. Frankie Adams finally got her chance to get her acting career started in 2010 when she was just 15 years old. That year, she landed a role in Shortland Street, a very popular New Zealand television series. The interesting thing about Frankie is that she managed to land this role which was a major TV series at the time, without prior TV experience. The only experience she had at the time was acting in a drama class. Apparently, she had been so good in drama class for her to have been spotted. Frankie was cast in Shortland Street to play the role of Ula Levi. The actress played this role for 5 years from 2010 to 2015 and appeared in as many as 278 episodes, a feat which earned her enormous popularity in New Zealand. She garnered a lot of fans who started following her on social media and prying into her life to know about her background. In 2016, after she had left Shortland Street, Frankie went on to feature in Wentworth, an Australian TV drama series in which she played the role of Tasha Goodwin for 2 episodes and gained some Australian fans for herself. The next year, 2017, Frankie acted in her first independent movie called One Thousand Ropes, a drama film in which she portrayed Ilisa. That same year, the actress landed a role in The Expanse, an American science fiction which gave her a lot of exposure in the USA. Frankie currently continues to feature in the series, portraying Roberta ‘Bobbie’ W. Draper. In 2018, she featured in her second independent movie called Mortal Engines, a post-apocalyptic adventure film in which she portrayed Yasmina. Frankie Adams is a daring woman who likes adventures and this informed her decision to take part in the Fight for Life charity boxing event organised by KFC in New Zealand. Before the fight, she was trained by Lolo Heimuli, a well known professional boxing trainer who gave her lots of confidence for the match. During the match, she faced Millie Elder-Homes, a popular New Zealand blogger. The fight was quite intense but even though Frankie did her best, she ended up losing the bout to Millie. Frankie Adams is in a loving relationship with a man identified as Vinnie Bennett. Vinnie is also an actor and has been in a relationship with Frankie for quite a while. The couple is very open about their affair and often post photos of each other on social media. However, there are no reports or indications that they are about to tie the knot as husband and wife very soon. The important thing, though, is that they are happy together. Fans admire Frankie for her beautiful face and well-shaped body which is perfectly accentuated by her height. The actress is quite a tall woman and is cute with her innocent face which fans have talked about quite a lot. Frankie stands at 5 ft 11 inches in height.